Today, we started the day playing mini-golf. The golf course was also a botanical garden, specializing in species native to Hawaii and Kauai in particular. We had a nice time playing mini-golf, and then later, Luke, Grandpa and I shared another round of golf at Makai Woods. Today, we did a lot better, walking away with a +3 over par. 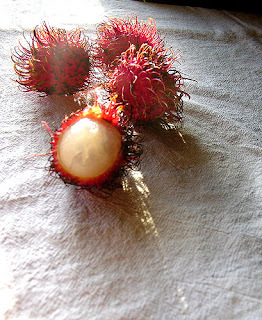 This is a "rambutan" that we bought at a local farmer's market. It peels like an orange, and tastes like a cross between a plum and a green grape, maybe similar to a lychee.